Here is our MapaWall Oak in an alluring space in Tielen, Belgium. 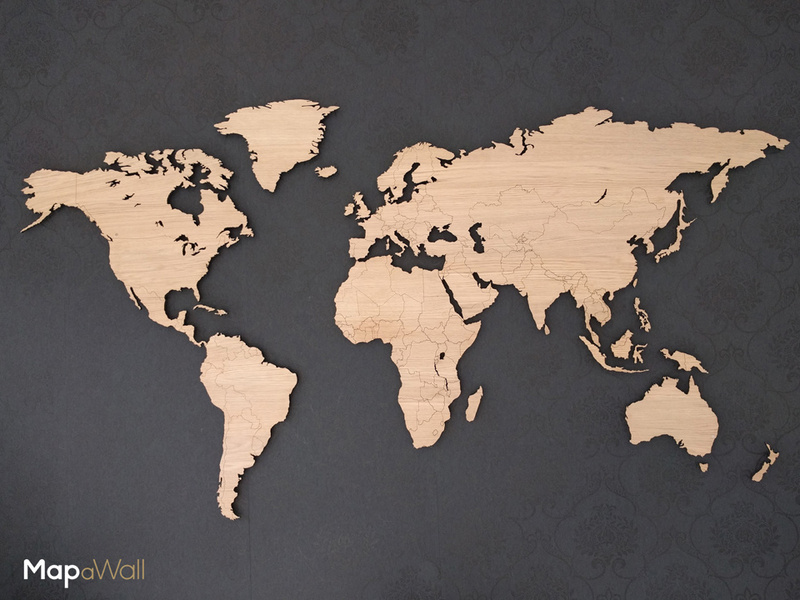 Our map has been delicately placed in this simple and sophisticated space on a dark, plain wall. 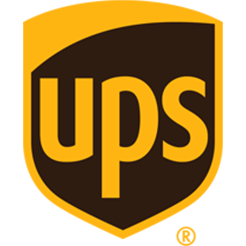 Our maps can be placed on a variety of different backgrounds creating a beautiful contrast. 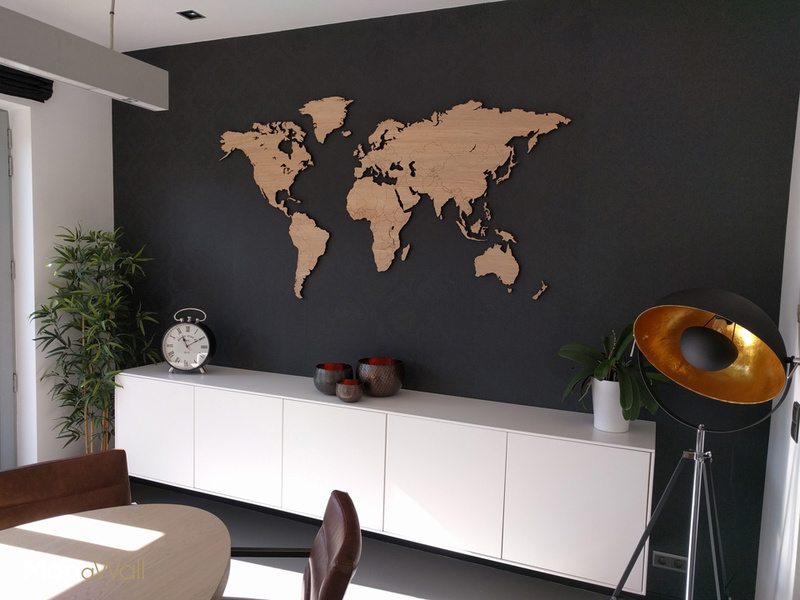 By placing this MapaWall Oak on a very dark background, it helps to bring out the light nature of this wood and emphasize every detail of the map. The client has fittingly chosen a strikingly dark wall on which to place this map. This piece works with the surrounding ornaments to add depth and texture to this space. 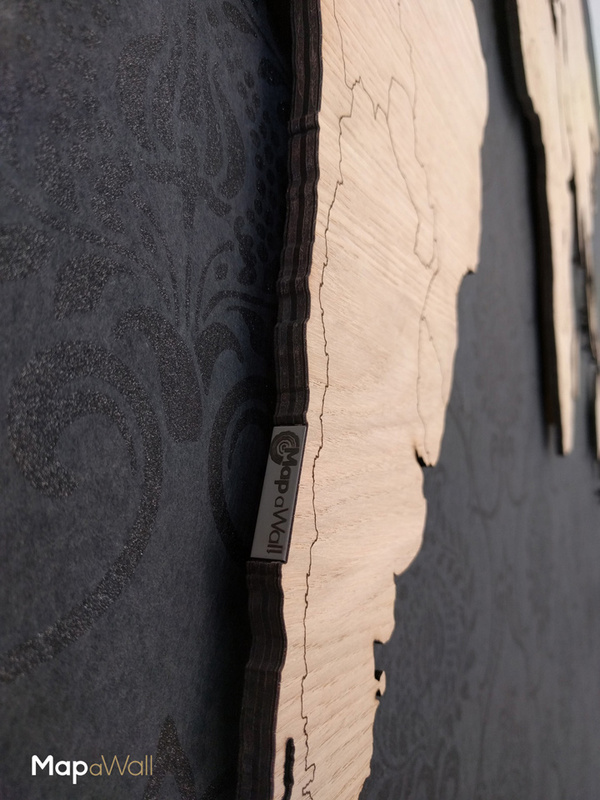 Our MapaWall Oak is our lightest wood. It is a gorgeous wood that is a fresh addition to any space. This particular map does not have an oil finish and, as you can see, still maintains a matte, light colored finish. This blends in beautifully with the other textures of the room and works as a direct contrast to the charcoal black wall. 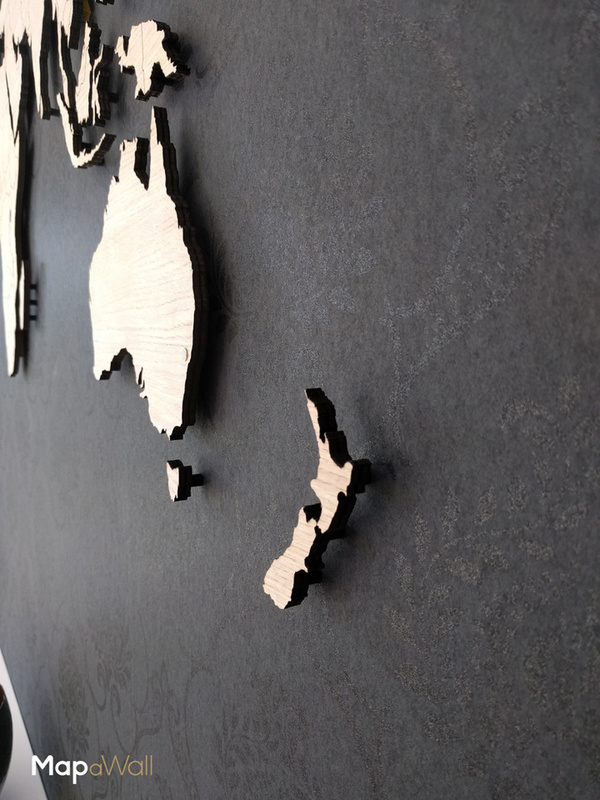 With such a dark background, the long and straight grain of the map is more visible, as well as the clearly defined country borders. The oak itself is also an excellent match for the room table. This is a great way to coordinate different parts of the room together. The client has chosen to go with a sophisticated interior design with a light and dark contrasting color scheme. The room boasts deep, rich colors of dark brown and charcoal black. These are seen in the statement lamp, dining chairs and candle holders. The client has equally looked to include lighter colors such as white, light oak and chrome finishes. The dark wood present in this room works elegantly with the light, straight grain of our MapaWall oak. The client has cleverly pieced together this room with an evident thought into every single detail.